Whilst searching for my elusive cell phone, I happened upon this strange ring. It has piqued my interest. I've been unable to find any information on it via Google and was hoping I might find some here.It is stamped k18 and a symbol similar to a Mercedes symbol...a "Y" within a circle. 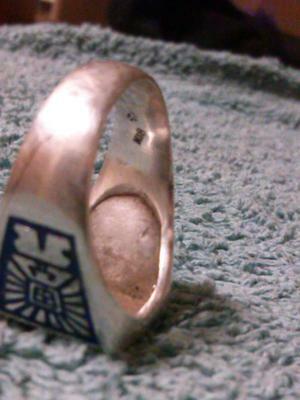 The ring itself looks Aztec like to me. Any information would be helpful. Thank you.